One brief Twilight-related interruption later, and now it’s back to Gotham City for this column. Two weeks ago I discussed the musical extravagances visited upon this fabled metropolis by Danny Elfman and Elliot Goldenthal, and now it’s time to discuss the themes that ought to be more familiar to all of us – namely, the work of Hans Zimmer and James Newton Howard in giving the revamped film franchise a revamped score. Christopher Nolan was the visionary filmmaker chosen to spearhead an entirely novel and much darker take on DC’s man in black. Nolan envisaged a totally different Gotham to the dystopian gothic sprawl we’d come to know, and put together a grim, gritty, and atmospheric world for Bruce Wayne and his alter-ego to inhabit. The result was a seminal and mesmerising film which gave the audience their first truly vivid and stark depiction of Wayne’s life and character. Complete with the a comprehensive explanation as to why a grown man suddenly decided to become a masked vigilante (and as to how he learned to beat people to a pulp with his bare hands), the film was the first intelligent and visceral depiction of the origins of the dark knight. It thus called for a similarly visceral score. Zimmer and Newton Howard followed Nolan’s lead in stripping the saga back to its bare roots and conceived a cerebral and insidious, though no less formidable, score. 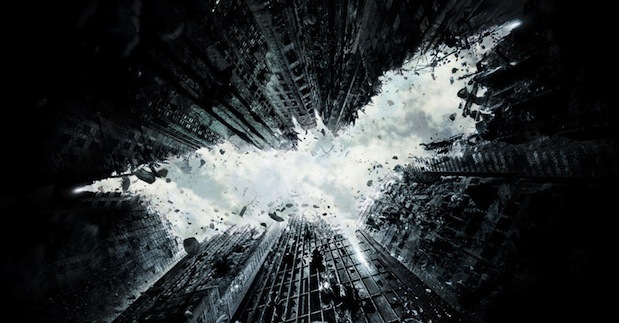 If Batman Begins explores the legend’s murky origins, The Dark Knight discovers its true potential. The music for Batman Begins is dramatic and gripping, yet in many ways quite haunted – as if it too were afflicted with the insecurities and concerns that befall the lead character. It is necessarily more understated than the sequel and hints at greatness but waits for the second film to really achieve it. The use of two composers was inspired in conveying the protagonist’s split personality. While there are similarities to the way they compose, Zimmer is particularly adept at striking, breathtaking movements while Howard excels in crafting pieces that are more tender and poignant. These differences spill over into their work on the score, allowing for a marked contrast between the instincts of Batman and the conscience of Bruce Wayne. The score mixes orchestral and electronic music to capture both a classic and human feel and the more surreal darkness of the comics. All the tracks on Batman Begins are named after species of bats, and they lay basic foundations for music that would really grow into itself and flourish with The Dark Knight. A boy soprano is used to convey the innocence and sudden, devastating sadness of the loss of Wayne’s parents, and there are delicate glimmers of affection in the theme used during his interactions with Rachel. “Myotis” is a particularly arresting example of the score’s different dimensions. The heartfelt opening refrains ebb and flow, creeping up on Wayne from a place of crippling darkness just as his bitter and painful memories do. It escalates gradually, with spectral and foreboding movements edging out from the shadows before all is pushed into a climactic battle of wills. Yet, interspersed with this sudden rush of bombast is a grim and increasingly arduous sense of heroism; a deathly sombre string section urges Wayne to consider the reality of the lives around him and the implications for them. The nascent theme of the hero himself is barely visible in the closing notes, still cloaked and unsure of itself, yet edging delicately towards discovery. This parallel between huge, forceful swells of music and something more humanistic is also evident in The Dark Knight. The basic themes remain the same, but everything is intensified and charged to match the higher stakes. The opening track, “Why So Serious,” is a fine indication of what’s to follow. Its first minute and 10 seconds is essentially the Joker’s theme – a painfully suspenseful string note that holds, agonisingly, for what seems like forever. It’s precarious and electrifying, capturing both the danger the villain poses as well as the magnitude of his appeal. The power of this soundtrack lies in its ability to get under your skin, to grip and command you as though you, too, were a harrowed onlooker in Gotham. It’s huge, sprawling, and knocks you clean off your feet. “Introduce a Little Anarchy” (this score uses quotes from the film to name its tracks) is the prevailing action theme. The rushing onslaught of music – a perilous string section laid over tense and ominous percussion, with the hero theme resurging solemnly at intervals throughout – is almost feral yet reflects too a growing sense of exhilaration as we become so invested with the character as to really, desperately root for him. Everything is urgent and breathless and tense, your heart pounding with the throbbing bombast of the music. It has been said that the Batman character came of age with Nolan’s take on the Caped Crusader, and in many ways so too did his theme. Zimmer and Howard’s stellar work found a way to capture the figure’s demons and his solitude, while also justly serenading his heroism. Zimmer at least is attached to the next theatrical instalment, The Dark Knight Rises, and has rather intriguingly offered fans a chance to add their vocals to a chant for the score. It could be that the people Batman has fought for for so long rally in his support, finding a collective voice to spur him on. Either way, the anticipation is palpable.